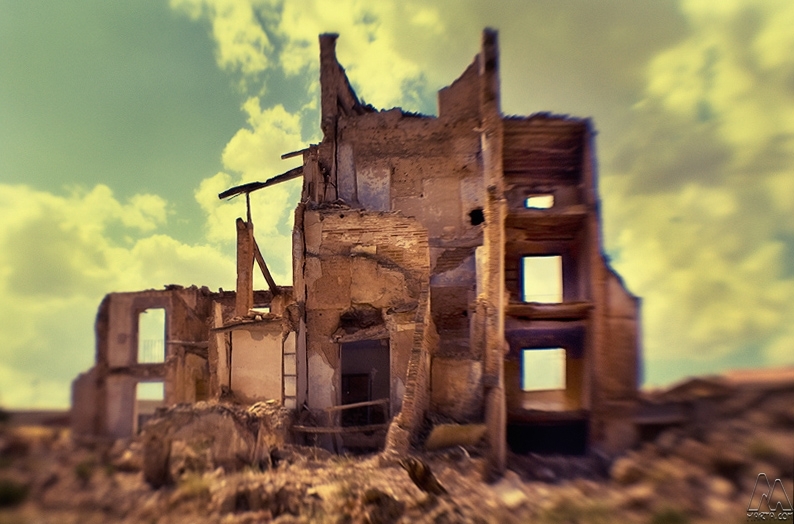 Ghost Town of Belchite, Zaragoza. los lensbaby tienen algo mágico. Tendré que provarlos algun dia. WoW! Fantastic and very creative. I can almost feel the nuclear fallout affecting my vision! Wonderful application of the lensbaby! ahhh this is so beautiful and what a great thing to use your lensbaby. It's just perfect! Amazing, beautiful and a bit scary at the same time. Great shot. Excellent lensbaby shot. Looks like a miniature model ... the title is perfect. Muchas felicidades por tu fotoblog, me ha encantado...soy un aficionado, hijo de Ricardo Caballero y Paky Lopez, quizas los conozcas...me he empezado a aficionar en el mundo de la fotografia, un placer poder disfrutar de las tuyas, un saludo!!! amazing, now I know for sure that I want a lensbaby! t'ha quedat mol be amb l'efecte Lensbaby, un dia me l'hauràs de prestar! molt maca tot plegat encara que la casa sigui una pura ruïna. Em recorda al Mecanoscrit del segon origen, del Manuel de Pedrolo. El títol molt encertat, no només pel tema fotografiat sinó per l'efecte que li has donat, molt bona. It really does have an end-of-the- world feel. Love the lensbaby effect. Very abstract yet very beautiful. Good work with that Lensbaby. Very nicely done. Very surreal feeling. This is a beautiful shot. I like how torn I am between real and dollhouse. Looks just like another day in Iraq! Whoa! Surreal is hardly adequate to describe this image. Giving the title this could be the nuclear holocaust. Infact it could also be a new beginning, the sun peaking through the nuclear winter, giving new birth to the earth. Fantastic foto Marta...i love this tone colour. Regards from Yogyakarta Indonesia. Excellent composition, great creative effect with the blur and lovely tones. The tones work so well and I love the surreal affect of the "Orton" style effect. Why POST apocalyptic? It is still ! Cada vez me gustan mas las lensbaby. Foto perfectamente resuelta y buen resultado entre la lente y el procesado. The tone is agian great. The 'falling into the shot' effect is nice but not nescecary. estupenda... les ruïnes sempre són un tema molt fotogénic que permeten birguerias... molt encertat el tractament.